Lopon Tchechu Rinpoche was born in the Kingdom of Bhutan in 1918. He spent most of his life living in Nepal and was regarded as being one of the foremost Buddhist masters of our times. In the late 1980s he began to look Westwards. He taught and gave initiations to thousands of people around the world and built a total of sixteen Stupas in Europe and Russia. 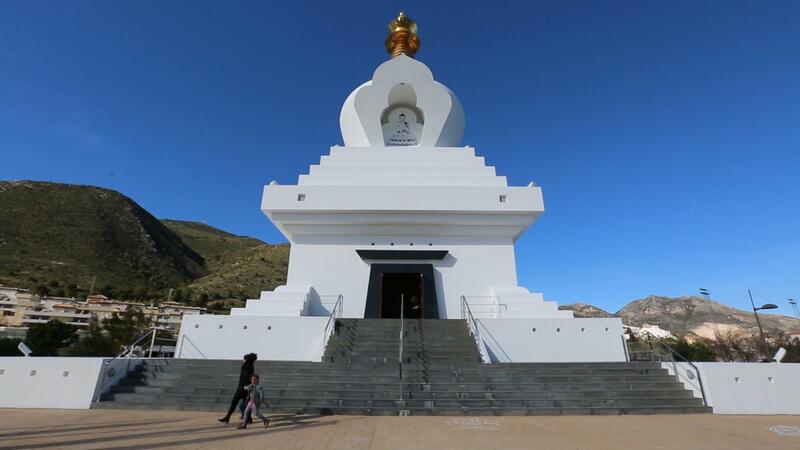 Rinpoche’s last project, the Enlightment Stupa in Benalmádena, the largest Stupa in the West, is considered by many to the crown jewel of his life’s work. Rinpoche passed away four months before the inauguration of the Stupa aged 85. According to Buddhism there are 8 types of Tibetan Stupas. Each of them represents an important event in the life of the Buddha. The Enlightenment Stupa symbolizes his enlightenment. Stupa can be roughly translated into “spiritual monument.” With thousands of years of history and built across numerous countries, there are some discrepancies in the original meanings. The Tibetan word for Stupa is Chorten, which means the “basis of offering”. The word Stupa, can also be translated as mound or heap, and was used to cover up relics – Buddha was cremated and his ashes were divided across eight Stupas. Symbolically the shape of the Stupa is thought to be that of Buddha sitting in meditation. The top of the spire is his crown, his head is the square at the base of the spire, the vase shape is his body, the four steps beneath represent his legs and his throne is the base. The temple was built on the observation platform, by the Polish architect, Wojtek Kossowski. 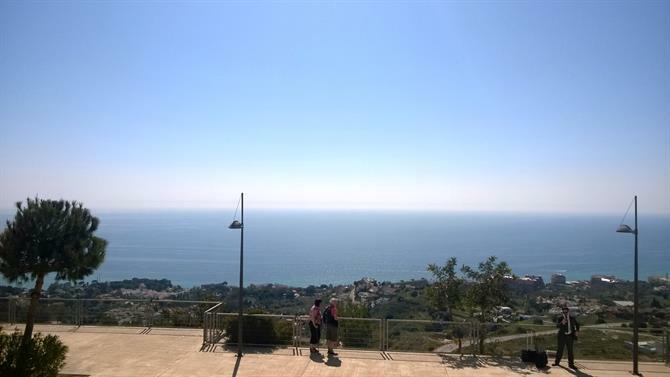 You couldn't hope for a better location, with spectacular views. The materials from which the Stupa is constructed are typically Andalusian and the white-washed colour fits perfectly into the landscape (Eastern Stupas are usually brighly coloured). The white colour is the not the only thing that makes this Stupa unique. With over 30 metres in height and offering close to 100sqm of meditation space, the Enlighment Stupa is considered the largest in the Western world. The Stupa is open daily, except for Mondays. It can be visited from Tuesday to Friday from 10.00 to 14.00 and from 15.30 to 18.30. On Sunday you can go inside from 10.00 to 14.30 and from 15.30 to 19.00. 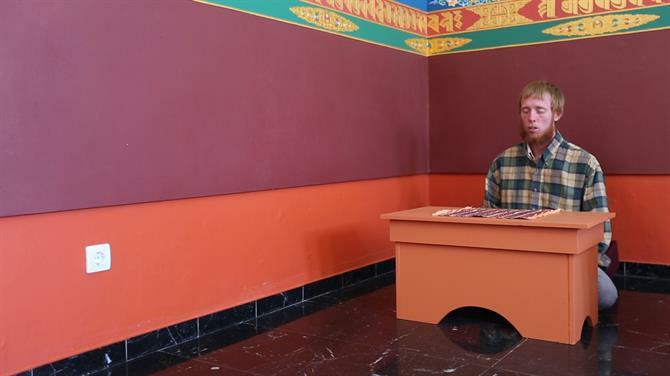 Entry is free, but you pay for watching exposition on Tibetan Buddhism and Himalayan culture, located in the underground part of the temple, the price per person is € 2. There are free mediation classes every Tuesday and Friday at 18:00. A contribution is appreciated. 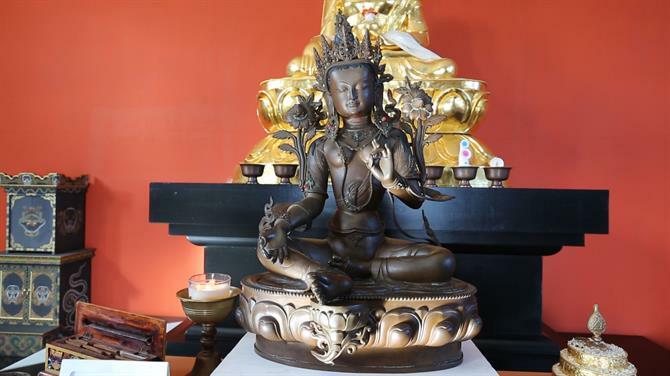 On Sundays at 18.00, there are often conferences and lectures on Tibetan Buddhist philosophy. Check the website (below) for further details. 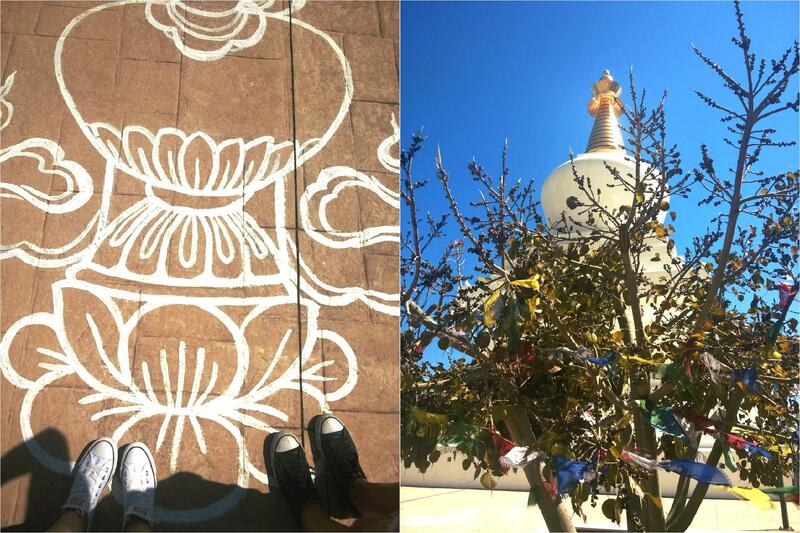 Something you should try while visiting, is walking clockwise around the Stupa. According to Buddhist tradition your wishes will come try if you do. Can't hurt to try. When driving along the A7 motorway, the Benalmádena Stupa seems to appear out of nowhere. When you see it though, you have usually missed the exit. If coming from Málaga or from the Fuengirola side keep your eyes open for exit 217 - Benalmádena Mijas. Follow the road towards Benalmádena Pueblo (signposted), you'll drive right past the Stupa. Can't miss it. From either Málaga or Fuengirola, get off at Benalmádena - Arroyo de la Miel. There's a bus stop in front of the train station, take the one towards Benalmádena Pueblo and get off at the "Estupa Tibetana." There are buses to Benalmádena Pueblo from Benalmádena Costa , Málaga and Torremolinos. For more information see the links below. The largest Stupa in the western world is situated in Benalmádena. Here's all the information you'll need to visit it. Benalmadena is home to Europe's largest butterfly park. Come and feel the experience of more than 1500 butterflies flying around you.